The Oscilloscope is one of the most important tools you will find on the workbench of any electronics engineer or maker. It is primarily used for viewing waveform and determining voltage levels, frequency, noise and other parameters of signals applied at its input that might change over time. It is also used by embedded software developers for code debugging and technicians for troubleshooting electronic devices during repair. These reasons make the oscilloscope a must have tool for any engineer. The only issue is they can be very expensive, Oscilloscopes that performs the most basic of functions with the least accuracy can be as expensive as $45 to $100 while the more advanced and efficient have cost over a $150. 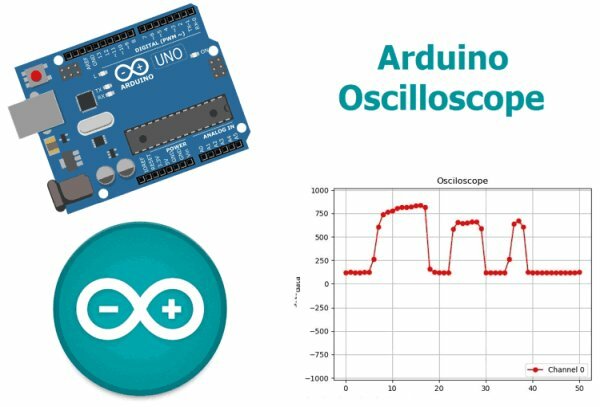 Today I will be demonstrating how to use the Arduino and a software, which will be developed with my favourite programming language Python, to build a low cost, 4-channel Arduino oscilloscope capable of performing the tasks for which some of the cheap oscilloscope are deployed like the display of waveforms and determination of voltage levels for signals. Oscilloscopes generally involve the visual representation of an analog signal applied to its input channel. To achieve this, we need to first convert the signal from analog to digital and then plot the data. For the conversion, we will be leveraging on the ADC (Analog to Digital converter) on the atmega328p microcontroller used by the Arduino to convert the Analog data at the signal input to a digital signal. After conversion, the value per time is sent via UART from the Arduino to the PC where the plotter software which will be developed using python will convert the incoming stream of data to a waveform by plotting each data against time. 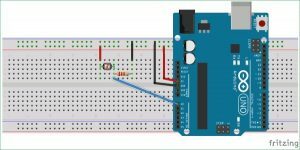 The schematic for the Arduino Oscilloscope is simple. All we need to do is connect the signal to be examined to the specified Analog pin of the Arduino. However, we will be using the LDR in a simple voltage divider setup to generate the signal to be examined, such that the generated waveform will describe the voltage level, based on the intensity of light around the LDR. After connection, the setup should like the image below. With the connections all done, we can proceed to write the code. We will be writing codes for each of the two sections. For the Plotter as mentioned earlier, we will be writing a python script that accepts the data from the Arduino via UART and Plots, while for the converter, we will be writing an Arduino sketch that takes in the data from the ADC and converts it to voltage levels which are sent to the plotter. Since the python code is more complex, we will start with it. We will be using a couple of libraries including; drawnow, Matplotlib and Pyserial with the python script as mentioned earlier. Pyserial allows us to create a python script that can communicate over the serial port, Matplotlib gives us the ability to generate plots from the data received over the serial port and drawnow provides a means for us to update the plot in real time. There are several ways to install these packages on your PC, the easiest being via pip. Pip can be installed via command line on a windows or linux machine. PIP is packaged with python3 so I will advise you install python3 and check the box about adding python to path. If you are having issues with installing pip, check out this the official python website for tips. With pip installed, we can now install the other libraries we need. With the installation complete, we are now ready to write the python script. The python script for this project is similar to the one I wrote for the Raspberry Pi Based Oscilloscope. Next, we create and initialize the variables that will be used during the code. The array val will be used to store the data received from the serial port and cnt will be used to count. Data at location 0 will be deleted after every 50 data counts. This is done to keep the data being displayed on the oscilloscope. Next, we create the serial port object through which the Arduino will communicate with our python script. Ensure the com port specified below is the same com port through which your Arduino board communicates with the IDE. The 115200 baud rate used above was used to ensure high speed communication with the Arduino. To prevent errors, the Arduino serial port must also be enabled to communicate with this baud rate. we need to create a function to generate the plot from the data received, creating the upper and minimum limit we are expecting, which in this case is 1023 based on the resolution of the Arduino’s ADC. We also set the title, label each axis and add a legend to make it easy to identify the plot. With this done, we are now ready to write the main loop that takes the data from the serial port when available and plots it. To synchronize with the Arduino, a handshake data is sent to the Arduino by the python script to indicate its readiness to read data. 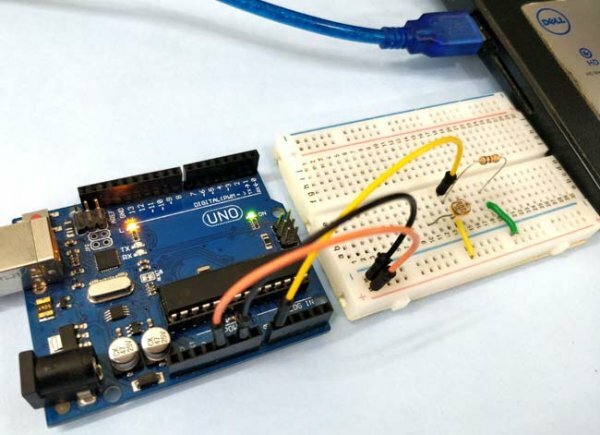 When the Arduino receives the handshake data, it replies with data from the ADC. Without this handshake, we will not be able to plot the data in real time. # Sleep for half a second. The complete python code for arduino oscilloscope is given at the end of this article shown below. 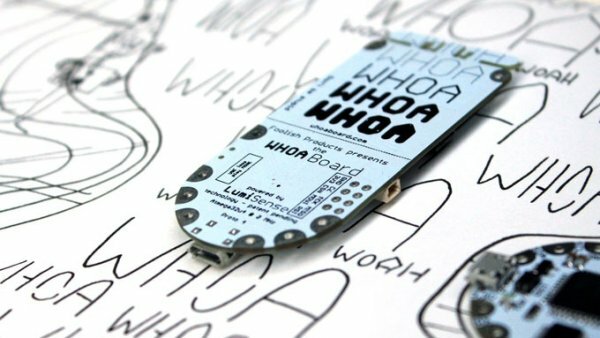 The second code is the Arduino sketch to obtain the data representing the signal from the ADC, then wait to receive the handshake signal from the plotter software. As soon as it receives the handshake signal, it sends the acquired data to the plotter software via UART. We start by declaring the pin of the Analog pin of the Arduino to which the signal will be applied. Lastly, the voidloop() function which handles the reading of the data, and sends the data over serial to the plotter.